We know that Jacques Rancière speaks about the relation between politics and aesthetics in terms of “the distribution of the sensible.” Tonight I want to speak about the distribution of the insensible. And I want to argue that it is the specificity of this problem which allows us to think the relation between the history of capital and the history of mimesis. Crucially, I want to show how the relation between those two histories is mediated by another: the history of technology. The relation between the history of capital and the history of mimesis is mediated by the history of technics. And it is through this history, this mediation, that art takes up techniques which throw us back outside the history of capital, outside the history of mimesis—indeed, outside the history of the human, the history of thought, and the history of sensation—within and through the technical means to which the linked histories of capital, mimesis, and technics give rise. These are my positive claims, my theses if you will, which I eventually want to develop and illustrate through the recent work of a contemporary Montréal artist, Nicolas Baier. But I also want to register an implicit critical dimension of this argument, a critique of Rancière and of his presently immense influence, which I view as unwarranted. I could summarize this critique as follows: if Rancière were more inclined to focus his attention upon the distribution of the insensible, perhaps he might think more perspicuously not only about the relation between politics and aesthetics, but also the relation between political economy and aesthetics. That is: focusing on the specific problem of the distribution of the insensible turns out to be the key to thinking about the relation between aesthetics and politics in a materialist way, in a manner properly responsive to the exigencies of Marxist historical materialism. Labor is, first of all, a process between man and nature, a process by which man, through his own actions, mediates, regulates and controls the metabolism between himself and nature. He confronts the materials of nature as a force of nature. He sets in motion the natural forces which belong to his own body, his arms, legs, head and hands, in order to appropriate the materials of nature in a form adapted to his own needs. Through this movement he acts upon external nature and changes it, and in this way his simultaneously changes his own nature. We can thus view the process of production either from the perspective of the labor process or the valorization process. But insofar as it is specifically capitalist, what the process of production produces is value, and a particular kind of value: surplus value and its reintegration into the production process as capital. To grasp the significance of this fact, one has to push it to its limit, as does Marx. We can view the process of production from two sides, but what it produces are commodities that are sold for money, which is reinvested in the production process and thereby becomes capital. Production produces both surplus value and capital, and capital produces expanded cycles of accumulation. As Marx tells us in Chapter 8 of Volume One, “the means of production on one hand, labor-power on the other, are merely the different forms of existence which the value of the original capital assumed when it lost its monetary form and was transformed into the various factors of the production process.” Both the means of production and labor power are different elements of capital in its own valorization process. This is what we mean when we speak of the “subsumption” of labor by capital. The concrete process of transforming materials through labor, aided by tools, is subsumed by the abstract process of valorization. So, this brief summary of Marxist fundamentals is our first approach to the distribution of the insensible. The critique of political economy is bound up with the Marxist analytic of value and valorization: the production, self-presupposition, and expanded reproduction of capital that is called “accumulation.” With regard to the critical dimension of my argument, then, we can say first of all that the vulgar empiricism of Rancière’s approach to the figure of “the worker,” throughout his corpus, proceeds exclusively from the perspective of the labor process, ignoring the valorization process. This is why he is not a Marxist. He does not think the distribution of the insensible, the movement of valorization, and thus he misses entirely the dimension of political economy in his thinking of politics. One consequence of this failure is that he has no rigorous means of accounting for the relation of his history of art and artistic regimes to the history of capital, to structural changes of the contradiction between capital and labor. In my opinion, this is a problem substantial enough to render his history of aesthetics more or less irrelevant. The exchange abstraction excludes everything that makes up history, human and even natural history. The entire empirical reality of facts, events and description by which one moment and locality of time and space is distinguished from another is wiped out. Time and space assume thereby that character of absolute historical timelessness and universality which must mark the exchange abstraction as a whole and each of its features. In Sohn-Rethel’s account, the exchange relation gives rise to a social genesis of the transcendental (the forms of intuition and the categories of the understanding). And this social genesis is at once material and abstract, since the exchange value of a commodity is borne by its use value, and since exchange (like the labor process) is a physical act which also requires abstraction from all physicality. In exchange, abstraction must be made from the physical nature of the commodities and from any changes that could occur to it….On the other hand, the act of property transfer involved in the transaction is a physical act itself, consisting of real movements of material substances through time and space. Hence the exchange process presents a physicality of its own, so to speak, endowed with the status of reality which is on a par with the material physicality of the commodities which it excludes. Thus the negation of the natural and material physicality constitutes the positive reality of the abstract social physicality of the exchange processes from which the network of society is woven. In the act of exchange, the natural and material physicality of the product is negated by the abstract value of the commodity, and this negation constitutes the “positive reality” of the social physicality of the exchange process. This is what Sohn-Rethel, following Marx, calls “the real abstraction” of the value form as a social process of exchange. This real abstraction constitutes a kind of “second nature,” and Sohn-Rethel argues that this second nature is “the arsenal from which intellectual labor through the eras of commodity exchange draws its conceptual resources.” We can situate this analysis more broadly at the level of the whole process of valorization, or the accumulation of capital through circulation. The social process of valorization is the very medium in which we think, and to which thinking is applied through intellectual labor (such as management). Insofar as intellectual labor is subsumed by capital, as is manual labor, the forms of thought themselves enter into a relation of dialectical genesis with the value form. For Sohn-Rethel, the Kantian transcendental subject is the representative modern figure of this dialectic (though its status as such is occluded by the idealism of transcendental philosophy). But we can also recognize, as Catherine Malabou argues in What Should We Do With Our Brain?, that there is a structural homology between post-Fordist management discourse emphasizing non-hierarchical networks, self-organization, flexibility, and innovation, and contemporary neurological theory, which views the brain as a decentralized network of neuronal assemblies and emphasizes neurological plasticity as the ground of cognitive flexibility and adaptation. According to Malabou, “neuronal functioning and social functioning interdetermine each other and mutually give each other form…to the point where it is no longer possible to distinguish them.” The structure of the real abstraction moves with the changing structure of the contradiction between capital and labor, which is the history of capitalism, and the structure of cognition moves along with it. Such would be a historical materialist account of conceptual abstraction following from Sohn-Rethel’s critical of idealist epistemology. This is a second approach to the distribution of the insensible. Simply put, the way we think—the form of thinking—is dialectically intertwined with the structure and the historical movement of capitalist accumulation. The movement of the concept is also the movement of value. The history of modernity, which is to say the history of capitalism, is also the history of modern technology. And it goes without saying that the history of technics conditions the history of thought. We need to supplement Sohn-Rethel’s materialist critique of epistemology with a history of media technologies like that carried out by Friedrich Kittler. And indeed, Kittler’s media-theoretical analysis of discourse networks should also be understood as a materialist critique of Kantian idealism. For Kittler, it is not transcendental categories but media technologies which determine the conditions of any possible experience. Media constitute the technological a priori of thought, sensation, communication: this is what Kittler means when he says that “media determine our situation.” Thus, Kittler tracks transformations of this technological a priori across epistemic shifts determining any access to something like a history of modernity. In the discourse network of 1800, the book is the site of an encounter between reading and writing, wherein the romantic imagination produces a projection of the soul into what Novalis calls “a real, visible world,” written into and read off of printed signifiers, emerging from the text as synaesthetic phantasmagoria in which all the senses are drawn together by the hallucinatory experience of Literature. In the discourse network of 1900, gramophone, film, and typewriter effect an analytic separation of this sensory synthesis, constituting distinct technologies of recording and transmission for sound, the moving image, and the written word. What Kittler calls “media differentiation” carves up the Romantic imagination, sutured to the book, and parcels out its capacities among discrete technologies addressed to a segmented perceiver: an ear, an eye, a mind—a modernist collage of the formerly integral subject. And then—in the discourse network of 2000, spawned by the cybernetic systems, information theories, and encryption technologies of World War II, digital technology draws media differentiation back together through the synthetic resources of digital code, a universal medium traversing audio, video, and textual recording. But this time the synthesis is inhuman and computational—soulless. According to Kittler, “the general digitization of channels and information erases the differences among individual media,” such that “inside computers themselves everything becomes a number: quantity without image, sound, or voice.” Digital information technology destroys the image of man as the subject of knowledge and of its synthetic production. It communicates with itself, through its own data channels, and consciousness is the epiphenomenon of communication. This, then, is a third approach to the distribution of the insensible. In a materialist inversion of the Kantian transcendental, media technologies constitute the a priori conditions of possibility for the sensible, such that the distribution of the sensible already operates within these conditions. Thus Kittler can write: “technologies that not only subvert writing, but engulf it and carry it off along with so-called Man, render their own description impossible.” Since the technological a priori is itself the condition of any possible description, it cannot itself be described. This is Kittler’s transcendental argument. Media technology is the unconscious of modernity. However (fourth approach)—we should recognize that just as Kittler’s media theory offers a necessary supplement to Sohn-Rethel’s account of the social genesis of conceptual abstraction, it is also necessary to submit Kittler’s own work to a Marxist inversion. 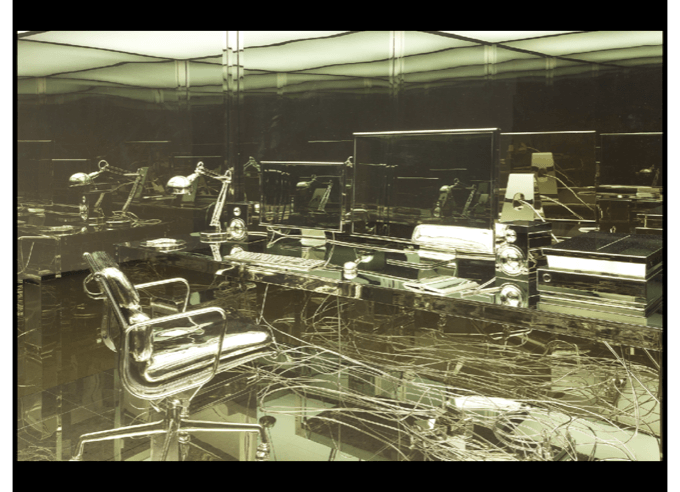 From the industrial revolution to the production and networking of digital information technologies, the history of modern technology emerges from and responds to the demands and internal contradictions of capitalist accumulation. Marx offers the analytical resources to understand the dynamics of this history precisely. This contradiction bears upon the history of technology, because it is by revolutionizing the means of production that capital attempts to overcome this contradiction. New technologies of production, and new techniques of production (assembly lines, for example) make it possible to increase productivity, and thus increase the amount of surplus value that can be extracted in a certain period of time. Thus, without further increasing the length of the working day, one can increase surplus value (this called “relative surplus value”). This is what automation and capitalist management techniques—Taylorism and Fordism—are for. What Marx calls “real subsumption” is this revolutionizing of the production process such that it becomes properly capitalist. It is not only that labor is subsumed under the value form, but that the very constitution of labor itself changes. Importantly, then, real subsumption requires and depends upon technological innovation: the capitalist process of production both needs and produces new machines because these increase productivity within a given period of time and thus compensate for limits on the length of the working day. The process of real subsumption, however, bears another contradiction. Capital invested in raw materials and the instruments of production is called “constant capital.” Capital invested in the labor power of workers is called “variable capital.” Through the process of real subsumption, the ratio between these changes: relatively more capital is invested in the instruments of labor (technology) and relatively less capital is invested in labor power (wages). But Marx makes clear that the part of capital invested in constant capital does not undergo any alteration in the process of production, it does not increase (this is why it is called constant). The part of capital turned into labor power does, however, undergo an alteration: it reproduces its own value and produces an additional sum: surplus value. Thus, as relatively more capital is invested in constant capital and relatively less capital is invested in variable capital, relatively less capital is available for conversion into surplus value. Capital needs to invest more in technology in order to increase productivity and sustain the valorization process. But by doing so, it also decreases the amount of capital which can be converted into surplus value. Thus, due to forces of competition and technological innovation driving increased productivity, the rate of surplus value extraction tends to decline. This is what Marx calls the tendency of the rate of profit to fall. Automation, which is at once the most advanced sector of modern industry and the epitome of its practice, confronts the world of the commodity with a contradiction that it must somehow resolve: the same technical infrastructure that is capable of abolishing labor must at the same time preserve labor as a commodity—and indeed, as the sole generator of commodities. If automation, or for that matter any mechanisms, even less radical ones, that can increase productivity, are to be prevented from reducing socially necessary labor-time to an unacceptably low level, new forms of employment have to be created. A happy solution presents itself in the growth of the tertiary or service sector in response to the immense strain on the supply lines of the army responsible for distributing and hyping the commodities of the moment. The coincidence is neat: one the one hand, the system is faced with the necessity of reintegrating newly redundant labor; on the other, the very factitiousness of the needs associated with the commodities on offer calls out a whole battery of reserve forces. We could rephrase this by saying that Fordism both requires and paves the way for post-Fordism. Essentially, Society of the Spectacle is a book about the consequences of real subsumption, about the contradictions that it bears within its history and about the new regime of accumulation necessary to defer and compensate for the crises those contradictions contain. And behind the passage I just read, we can also read a commentary on the history of technology. The development of industrial automation both necessitates and creates the conditions of possibility for the invention of new media apparatuses, especially digital information technologies and networks. These not only enable the growth of the tertiary service sector and its forms of communicative labor and consumption, they also themselves produce new markets of goods and services. And more importantly, they are the technological ground for the massive growth of speculative markets we call “financialization,” which is predicated (in its contemporary form) upon the exchange of digital information. The tech boom and its implosion are the logical and necessary outcome of real subsumption, pushing beyond its limits into the society of the Spectacle. So, to come back to Kittler: it is not strictly true that media determines our situation. Capital determines our situation. The conditions of possible experience are themselves conditioned by the moving contradiction between capital and labor. The history of the sensible, the transformations undergone in the media-technological conditions of sensation and experience, is also the history of the insensible—the history of the process of valorization as it develops in relation to contradictions in the labor process. Shortly after he coined the term “immaterial labor,” Maurizio Lazzarato renounced it, for the good reason that the term was impossible to reconcile with a materialist position. He should have referred instead to “insensible labor.” Information and cognition are not immaterial, but they are insensible. And the forms of affective labor which precisely are sensed are premised upon the indistinction of labor and leisure, the impossibility of distinguishing them under conditions of post-Fordist accumulation. It is labor itself that becomes insensible under these conditions, dispersed into networks linking neurons and screens and indistinguishable from the most intimate gestures of our affective lives. At the same time, however, we know that a commodity like an Apple computer is, in fact, produced by processes quite clearly identifiable as “labor.” Despite the fact that every effort is made to keep this fact out of sight and out of mind, we know it because we read about it on Apple computers. A corporation like Foxxcon, the largest manufacturer of electronic components in the world, is something like a distillation of the entire history of the contradiction between capital and labor, the great movements of the industrial revolution, Taylorism, Fordism, the off-shoring of manufacturing labor, and the simultaneity of deindustrialization and post-Fordist cognitive capitalism with the persistence of the most traditional forms of miserable factory work. Indeed, bearing the conditions of its production in mind, one might view a device like an Apple computer as a distillation of the entire history of modernity—of the manner in which modernity acts upon external nature and changes it, and in this way simultaneously changes its own nature, from the printing press to the steam engine to the silicon chip. 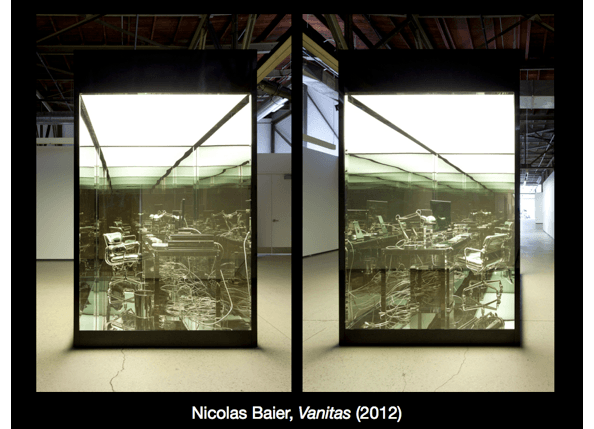 Consider the images I have been showing you, of a recent installation by Montréal artist Nicolas Baier. The main piece is the sculptural object we have been looking at, titled Vanitas, a reproduction of the artist’s office. How was it made? 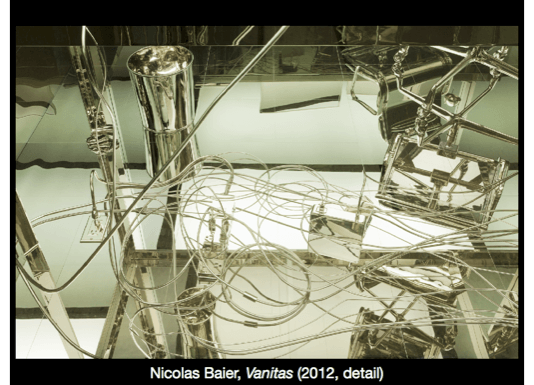 Composed of aluminum, nickel, steel, glass, vinyl, and fluorescent, the production of Vanitas involves a virtuosic performance of mimetic exactitude. Every component of the artist’s desk and of his tools is precisely rendered as either a three dimension drawing or a three dimensional scan. Each of these objects is then reproduced, at exact scale, by either machining in aluminum (in the case of objects that were drawn) or stereolithography (in the case of objects that were scanned). This process includes every electric or electronic plug and cord connecting Baier’s computer, his monitors, his speakers, and his scanner. It includes the crumpled pieces of paper in his trash can and a book lying open beside his keyboard. 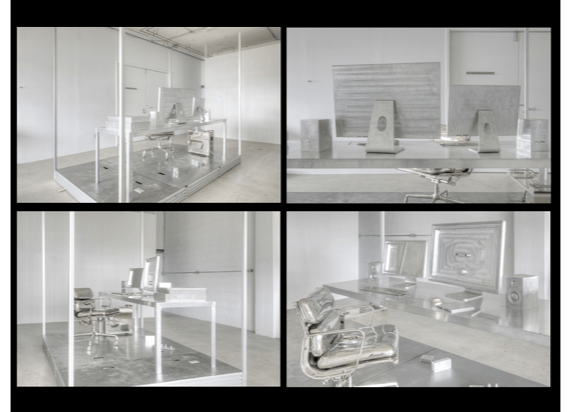 Each of these reproduced objects is then plated in mirrored nickel before being rearranged, in in a reproduction of their configuration, within a parallelepiped encased on all six sides in one-way mirrored glass and illuminated by overhead fluorescent light. The first thing we might note about this piece is its complex engagement with relational aesthetics. It mimics one of the primary gestures of that movement or style, bringing the artist’s studio and living space into the museum. But in doing so it forecloses the primary content of that gesture, radically separating this space from that of the viewer, encasing it within a mise-en-abyme in which only images interact with one another. Although it draws the space within which the artist works and thinks into the space of the museum, the artist is pointedly absent. The piece is something like an anti-humanist negation of relational aesthetics: perfectly finished, enclosed, complete, pristine, it subtracts the participation of the viewer precisely through the viewer’s gaze, which is drawn into and lost within the reflexive auto-mimesis of the object. Second, we can say that if Vanitas is a captivating work of art, much of what makes it so is money. Obviously it is expensive to reproduce one’s office in nickel-plated aluminum and to display it so dramatically. A tour de force of concept, design, and execution, the piece is also nothing if not resourceful. It patently shows off the artist’s mastery of that form of technē so crucial to contemporary art practice: the capacity to get funding. The artist has money. His studio is something like the Platonic form of so-called “immaterial labor”—designer furniture and designer devices, neatly arrayed with the precision of an architectural firm blessed with a particularly fastidious custodial staff. And the artist’s work costs money. The materials, techniques, and labor required to produce it do not come cheap. Look, the piece says: money, mastery, technē: art. It is an image of capital, reflected back upon itself. The mimēsis of capital. The labor of the artist is the transformation of money, through materials, into its own image. The piece is an image of this transformation. We should recall that this has always been the art historical function of the vanitas. Capital circulates. But here it does so in a closed system. That is, it does not circulate; rather, it reflects. At his desk, thinking, communicating, representing, the artist enters into the circuits of capital, the movement of valorization—as do we all, one way or another. Now, these circuits freeze. Characters and images cease to appear on the screen. No information or electricity flows through these wires. No music plays through the speakers on the desk. Digital technology has produced its own negation. The precise transformations of materials it enables—its retentional exactitude—precisely negate all transformation. We transform materials into technologies which, in turn, transform materials. And here they are transformed back into materials. But this is also to transform them into an art object: neither tool nor raw material, neither instrument nor that to which it is applied. Rather, a worked form, presented, apparently useless and withdrawn from exchange—though of course it has its uses and cannot help but find its way back to market. Baier’s piece instantiates the problem of the relation between materials and money, captured in the art object. The content of his piece is nothing other than that relation, a reflection upon that relation. And of course: this relation has a history, which is the history of modernity. This history, too, finds itself reflected in Vanitas. The distribution of the insensible: the movement of capital, the structural transformation of the contradiction between capital and labor, the circuitous courses of the process of valorization—all this is how a digital information system ends up inside a mirrored box in the company of fluorescent lighting and minimalist furnishings, installed on the distressed concrete floors of an art gallery. This movement, this transformation, this process is what we are looking at, though we cannot see it. Behind Vanitas, a glass reproduction of Baier’s eyeball at the center of a projected disc of light, gazing without seeing across the room at a mirrored box which does not reflect its image. In front of Vanitas, a meticulously composed compound photograph of the stone wall beside the earliest cave paintings, titled Canvas. Beside Vanitas, a fond de scène—a reflector used in the background of photo shoots—which Baier placed in a template with a circular hole and left in a window for nine months. 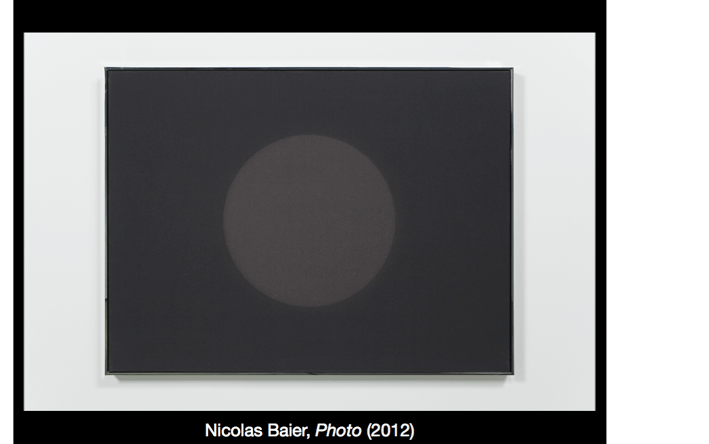 Not a reflection of the sun but an indexical image of its absorption, marked by the circular discoloration of the black tissue. A perfect suprematist portrait. 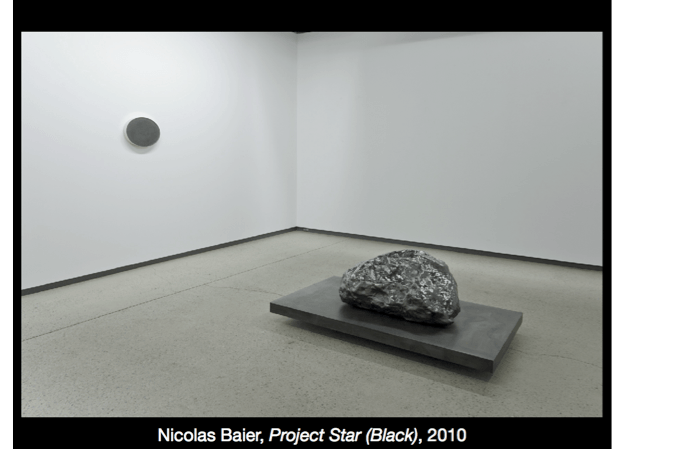 Around the corner, a piece called Projet Étoile (Noir), consisting of a graphite painting titled Monochrome (Black) and a sculptural replica of a meteorite recovered from Death Valley. Having held this meteorite in the palm of my hand, three years ago, I can testify to the strangeness of encountering its inexistence, distributed between these two art of objects. 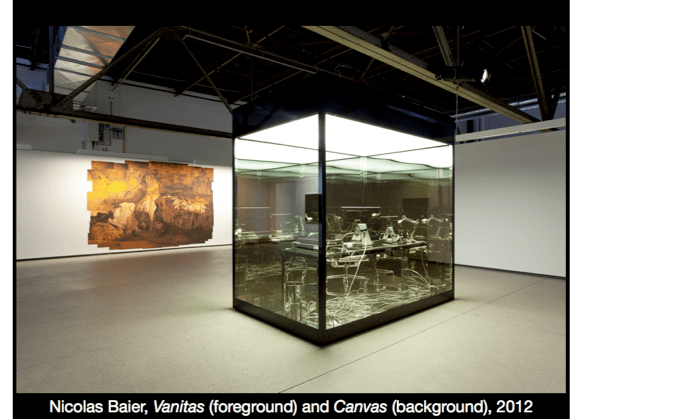 As he did with the objects reproduced in Vanitas, Baier made a three dimensional scan of the meteorite and then reproduced it—at a much larger scale—through stereolithography. He then melted the meteorite down and used the graphite of which it was composed to paint the surface of Monochrome (Black). The matter of the object thus remains, and so does its form, but the object itself has disappeared into an uncanny splitting of their formerly integral relation. 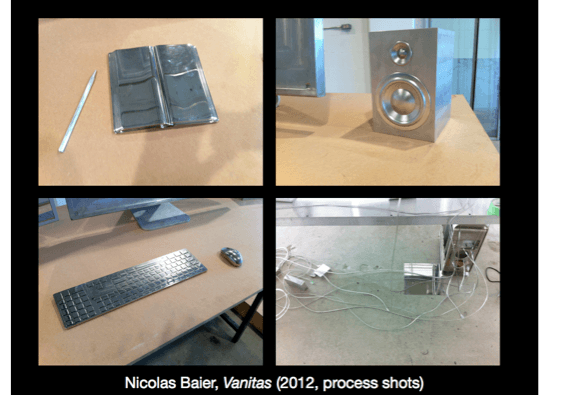 These are photographic pieces and sculptural objects which Baier would have worked on at the computer in the center of Vanitas. Instantiated as digital code, they were “in” that computer, stored in its memory banks, transformed on its screen. Now they surround its reflective mineral simulacrum, exteriorized. They are images of an exterior. Canvas shows us the primordial matter of mimesis: the substrate of inaugural images carved in stone, with stone. The inauguration of exteriority. Star (Black) confronts us with an extra-terrestrial outside, encountered, vanished, recorded—at once absent and yet uncannily present as residue and reproduction. These are images of the deep time of human and cosmological history, outside the limits of modernity, of capital and its enabling technologies of representation. What the installation asks us to think, however, is the manner in which it is these technologies of representation which record this outside, which draw our attention to it and make it manifest. And this suggests a sixth approach to the distribution of the insensible. 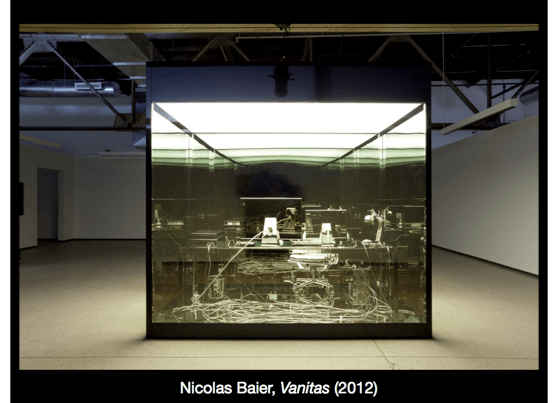 Like Malick’s The Tree of Life, Baier’s meteorite indexes a cosmological time and an inhuman history which never was sensed, which was prior to sensation—though, like Malick’s film, Baier makes this history manifest through the most sophisticated technological means of representation. Baier’s Canvas, a meticulous photographic recording of the bare stone wall beside the first recorded images, situates this indexical effort within the whole history of representation—again, carrying us outside the modern technics of mimetic exactitude which make the digital rendering of this stone wall possible in the first place. At the crux of materials and money—through the complex history that crux contains—the subject of Baier’s installation is the relation between memory, recording, mimesis. 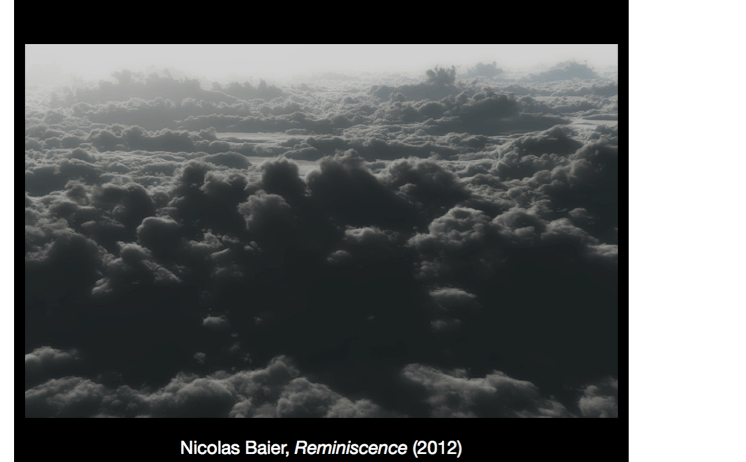 And this is why it also contains a photograph called Reminiscence.